Silver metallic shopping bags make a bold statement that will surely set your retail packaging apart from the rest. Metallic colors are a great choice for any retail packaging option ranging from contemporary to classic styling. Our silver metallic shopping bags are a muted silver tone comparable to brushed metal. A versatile product, this smaller size bag can be used in a variety of ways ranging from small gift items to wedding accessories and lingerie. 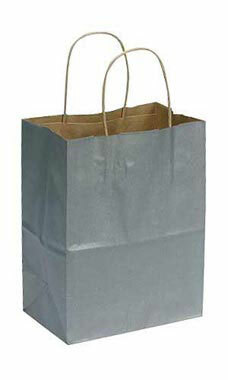 We also offer custom paper bags where you can add your logo, messaging and more. Check out all of our Custom Creations to build a comprehensive look that will make your store stand out from the competition!